Woo woo! I won the April 2019, Mslexia Little Ms flash fiction competition!! The year 2019 has started well; I was long-listed in the prestigious Mslexia Magazine’s flash fiction competition! Mslexia attracts the best writing from around the globe. The competition was judged by flash fiction innovater, Meg Pokrass. A seasonal 300-word story which captures the melancholy of the season, ‘Christmas Still in the Basement.’ Frosty the Snowman is just a crumpled heap in Tammy’s basement. Curious to know why? Find out here on the Casket of Fictional Delights. In October 2017, I was placed amongst the 10 prize winners of The Casket of Fictional Delights Flash Fiction competition. Bestselling author, Kit de Waal was the judge. Listen to actor, Vivien Taylor perform my story, To See a Star, set in wartime Amsterdam. Enjoy all the stories or fast forward to 6m 28 sec where my story begins on the podcast here. Caged Birds, a story set in Amsterdam’s Red Light District was published in Seven Deadly Sins anthology by Stringybark Publishing on sale here. A Wolf in Sheep’s Clothing about an old lady who is not as gullible as she appears, was also placed in the top thirty stories and published by Stringybark Publishing in their anthology, A Gentleman and a Scholar. Earlier in 2017, A Bit of Sparkle, set in a Bangladeshi sweatshop and a Bristolian working -class home, was accepted for 100 Voices volume III anthology. Available from Amazon via the link. In February 2016 and July 2017, I won the Little Ms, Flash Fiction Competition and my pieces were published in the Mslexia newsletter. Mslexia is an important literary magazine where many women writers have launched their careers, so this has given a real boost to my writing confidence. 2015, and my flash fiction story based on the true account of the SAS recruits who died of heatstroke on the eponymous, ‘Pen y Fan,’ was published in, Landmarks. 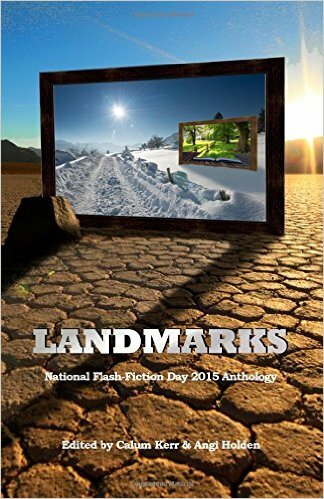 Landmarks is an anthology of the best flash fiction, published to celebrate National Flash Fiction day 2015. Rubbing shoulders with the great and the good of FF here! In 2014, ‘A Gibbous Moon’ was selected for the Raging Aardvark anthology! Two teenage girls perform an ancient Witches’ ceremony in their bedroom, after that strange and terrifying things happen. For sale on Amazon here. In 2012, ‘Meltdown,’ was performed at Liars League live storytelling event in Leeds and I was shortlisted in Fish Publishing Flash Fiction competition. Over 1,000 entrants took part! I also had four new stories published online, links below. All flash fiction pieces are under 500 words. Coming Home, an autobiographical story, published in Amsterdam Quarterly AQ7. The gentlemen are assembled, the brandy poured. And the club’s newest member has a startling tale to tell. Wolf at the Door, published in Writers Abroad Magazine. A new take on an old fairy tale. Flash fiction piece, Alchemy, set in a London art college in Thatcher’s Britain has been published on Story Shack. It is accompanied by a beautiful illustration of Myatt’s Fields by Sherri Oliver. Rafael’s Madonnna and conversations with the head of Fine and Decorative Arts at the Rijksmuseum, Gregor Weber inspired, A Veiled Lady published on Story Shack. Flash fiction piece Tryst, published on National Flash Flood blog as part of the celebrations for NFFD. Non-fiction, Ten Surprising Facts about Tulips, in Writers Abroad Magazine. Non-fiction, How to Swear like a Dutchie, in Writers Abroad Magazine. Women behind the Wire – memories of life in a Japanese internment camp in Summer 2011 issue of Herstoria. Read the article online here. Some articles/stories are published using my real name, Angela Williams. Thanks, Christine. Much of this happened since Frank found his lucky stone treasure at the pirates’ party. Luck must have rubbed off! What a great blog, would you like to check out mine? Very inspiring! Well done! I know somebody who is famous! you’ve opened the floodgates!! : ) well done!! Thanks for all your support, Soraya. Couldn’t have done it without you! Just been moseying (sp?) around your blog and found this. All very impressive. Especially being shortlisted in the Fish competition! What was the story about? Hi Jill, Thanks for dropping by! the story was about a woman crossing the Ij river on the ferry in Amsterdam during wartime. She fell in love with a fellow passenger. I don’t think I posted it on WA as I wrote it quite a while ago and had it critiqued by my face to face group several times. Thanks, Will. It was nice meeting you and it would be nice to keep in touch. I found the FL course really useful and inspiring. Would love to read the extended piece you wrote for FL when completed. I will be extending my piece too, I believe “Pixie” will grow substantially. Good luck with your writing. Thanks. I’ll be working on it next week so will be back in touch then. Are you on Twitter? A Ghost Story for #Christmas!